This bold new series by Greg Rucka and Michael Lark is set in a dystopian future where the world is ruled by a few very rich Families. The Families are powerful, and they employ a few serfs on their lands, whom they care for and treat reasonably well (for the most part). The rest of the world population is considered "Waste," and is treated as being beneath contempt. Each Family has invested in a single person, a guardian, a protector, an enforcer, given the best training and biotechnology money can buy -- a Lazarus. The story of this first issue begins with Forever, the Lazarus of Faimly Carlyle, being shot repeatedly by thugs from the Waste, at one of the Family's storage facilities. Forever should have died, but as a Lazarus, she seems to have very high regeneration properties, and within minutes, recovers from the bullets and returns to action, battling and killing the theives. She then returns to the Family's base of operations, where James, her doctor, examines her and gives her some platelet therapy. Forever expresses remorse at having to kill, which is trouble for the Family -- they need their Lazarus in top form. Her brother Jonah then calls on her to investigate a break-in by rival family Morray at the Carlyle's San Joaquin harvesting facility. They conclude it was an inside job by one of the serfs. By Family policy, Forever threatens to kill them all unless the guilty one steps forward. An elderly man confesses, and even though she knows he is lying, Forever kills him. Then she returns to James for an "oxytocin treatment," which James implies to Jonah will get rid of her feelings of remorse. I had heard good things about the first two issues of this series, so I decided to pick up a reprint of this one. I had no idea what to expect, and I have to say I was pleasantly surprised. The story, although violent, is deep and engaging. Rucka and Lark have created a very interesting dystopian world, and I am curious to learn more about what the geopolitical landscape looks like in this bleak rendition of the future. The idea that the world is run by cartels of "Families" now, rather than elected (or ordained) governments is rather original for dystopian science fiction. There are many unanswered questions in this issue regarding the setting. For example, other than Carlyle and Morray, how many other Families are there? Does any form of elected (or puppet) government exist, or is the world ruled by just the Families? Is every Lazarus like Forever, or does each one have its own unique powers and abilities? These questions will likely take many issues to answer, and I look forward to the slow unveiling of the world in the coming months. The main character, Forever ("Eve" for short) is definitely promising. 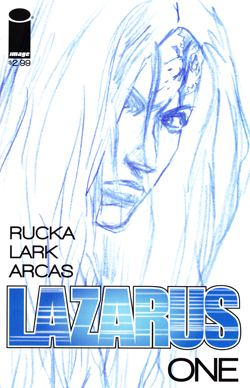 We get the sense that there are many layers to her, and I hope that over the coming months Rucka and Lark will peel those layers back like an onion, slowly revealing to us more and more of Eve's character. We know that she is basically a super-being with at least martial arts training and regeneration, but we do not know what other powers she may have. We also see, from the beginning, two critical, and seemingly inter-related aspects of her persona. First, the death/resurrection process is quite painful and traumatic for her. Her body doesn't "just heal." And second, she is starting to feel regret at killing her victims (even when they seem to deserve it, such as the theives who tried to kill her at the start of the issue). Although it's not stated explicitly, I definitely got the feeling that these two things are linked. Because she knows what it's like to feel herself dying, Eve seems to be empathizing with the people she kills. I suspect this will play out over the long term with this series, and I welcome watching the conflict within her develop. The art was quite good in this issue. Lark's layouts are conventional, but the art style itself is perfectly suited to the tone of the story. The coloring by Arcas is outstanding, alternating betwen dark tones and light in all the right places. In particular, I appreciated Lark's attention to background detail. Too often comic-book artists get lazy and throw in panels with absolutley no background. Lark certainly does this in a few places, but usually for emphasis, such as each time Eve kills someone in the opening sequence, or when she and her brother Jonah stare each other down in the seed storage facility. Finally, the range of facial expressions on Eve is very well done. The panel on the second-to-last page where she aims the gun at the old man knowing he is lying about his guilt, and that she's about to kill an innocent man, is very evocative. One final note: I greatly appreciated the presence, right on the first issue, of a space for the letter column, which has already been aptly named "Forever Yours." Readers are provided with a gmail address and are asked to please send in their feedback. Rucka and Lark (and Image Comics) welcome feedback from their readers -- something refreshing to see after so many months with DC's New 52 titles, which possess no letter column, and whose editors seem to have no interest in what readers think. Bonus points to Image and to Rucka and Lark for welcoming feedback and being willing to print that feedback in their pages. Also, I was floored by the length of the opening letter column space -- 6 pages in which Rucka was able to explain his thinking behind the series, and how it came to be. I don't expect future letter columns to be this long by any means, but I tip my hat to Image for being willing to print such a long essay from the writer. It's a shame this type of thing isn't provided more often in first issues these days. Overall, this is a very well-done comic. As a first issue, it hits all the right notes. It introduces the main character, provides us with the background of the world setting, and sets up the long-term conflict that we will see in the coming months. I can definitely see why there were such rave reviews of this issue a couple of months ago when it first came out. I slightly regret coming to the game late, but I'm definitely glad I came. I already own issue 2, and I can't wait to read it. DC and Marvel ought to buy this issue and take notes. This is how it's done.